BBC News is the first to be allowed to see inside the LHC – on the French-Swiss border – to watch the work being carried out. A project leader with the LHC’s Atlas experiment, Dr Pippa Wells told BBC News that there was much more to come from the LHC. “The past two years have been the most exciting in my time as a particle physicist. People are absolutely fired up. They’ve made one new discovery (the Higgs) and they want to make more discoveries with the new high energies that the upgrade will give us. We could find a new realm of particle physics”. I was taken by the technical coordinator for the upgrade project, Katy Foraz and Cern’s UK communications manager Stephanie Hills, to one of the many access points to the LHC’s underground tunnels…. 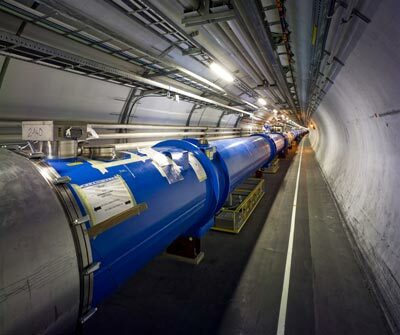 A group of physicists from Switzerland, Japan, Russia, US and the UK has proposed using the tunnel that currently houses the Large Hadron Collider (LHC) at the CERN particle-physics lab near Geneva for a dedicated machine to study the Higgs boson. 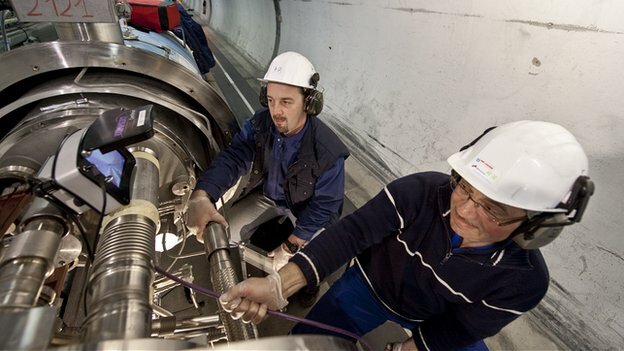 The facility, dubbed LEP3, is named after CERN’s previous accelerator, the Large Electron–Positron Collider (LEP), which used to exist in the LHC tunnel before being shut down in 2000. In a preliminary study submitted to the European Strategy Preparatory Group, LEP3’s backers say that the machine could be constructed within the next 10 years. The plans for LEP3 come just weeks after physicists working at CERN reported that they had discovered a new particle that bears a striking resemblance to a Higgs boson, as described by the Standard Model of particle physics. The ATLAS experiment measured its mass at around 125 GeV and the CMS experiment at 126 GeV. LEP3 would operate at 240 GeV and comprise two separate accelerator rings that would smash electrons and positrons rather than protons and protons, as with the LHC. In their study, the 20 authors call the concept for LEP3 “highly interesting” and that it deserves more detailed study. “Now is the right moment to get this on the table,” says theorist John Ellis from Kings College London in the UK, who is an author of the preliminary study and hopes that it will trigger debate among physicists as to how to study the new boson in detail. LEP3 is designed to be installed in the LHC tunnel and serve the two LHC’s general-purpose detectors – ATLAS and CMS. If LEP3 is to be built, it will have to fight off two rival proposals for a future collider to study the Higgs – the International Linear Collider (ILC) and the Compact Linear Collider (CLIC). But Ellis says that one advantage of LEP3 is that the tunnel to house it is already built and the collider would use the existing infrastructure, such as cryogenics equipment, thus making LEP3 more cost-effective. LEP3 would also use conventional electromagnets to accelerate particles rather than the accelerating superconducting cavities that will be employed by the ILC. Last weekend, I had the pleasure to be shift leader for ATLAS. It was a real pleasure for many reasons: being right in the middle of the action, surrounded by an international team of enthusiastic and dedicated people, and taking part in great teamwork. The shift crew (about ten people plus dozens of experts on call) must keep the detector running smoothly, tackling every problem, big or small, as fast as possible. Data was coming in at a high rate and all sub-detectors were humming nicely. Not a glitch in hours so we were getting slightly sleepy nearing the end of the shift around 22:00. So when a colleague from the trigger system (the system that decides which events are worth keeping) called to inquire about recurrent splashes of data, I was rather puzzled. I quickly went around, asking a few shifters to check their system. Nobody had a clue. Then I took a closer look at this plot that I had not scrutinized before since everything was so seamless. The two lower curves in beige and green show the instantaneous luminosity measured by the two largest detectors operating on the Large Hadron Collider (LHC), CMS andATLAS. This is a measure of how many collisions are happening per second in each experiment from the two beams of protons circulating in opposite direction in the LHC tunnel. If you look closely at these curves, they both have small dips at regular intervals. Since both ATLAS and CMS were registering these dips, it had to be coming from a common source, the LHC. This effect has been known since the LEP days, the Large Electron Positron collider, the LHC predecessor. The LHC reuses the same circular tunnel as LEP. Twenty some years ago, it then came as a surprise that, given the 27 km circumference of the accelerator, the gravitational force exerted by the moon on one side is not the same as the one felt at the opposite side, creating a small distortion of the tunnel. Since the moon’s effect is very small, only large bodies like oceans feel its effect in the form of tides. But the LHC is such a sensitive apparatus, it can detect the minute deformations created by the small differences in the gravitational force across its diameter. The effect is of course largest when the moon is full. What came as a surprise to me was to witness the dynamic aspect of it. As the moon was rising in the sky, the force it exerted changed ever so slightly, but even these infinitesimal changes were big enough to require a periodic correction of the orbit of the proton beams in the accelerator to adapt to a deformed tunnel. Other surprising disturbances were also observed in the LEP days like one that appeared every day at fixed times. It took months and a train company strike to figure it out. These perturbations were created by the passage of the fast train linking Geneva to Paris, the TGV, since it releases a lot of electrical energy into the ground. The LHC is also sensitive to the hydrostatic pressure created by the water level in nearby Lake Geneva that also deforms the tunnel shape. So next time you want to know if the moon is full, just check the luminosity plot from the LHC to see if you can spot those small glitches caused by the operator correcting the beam orbit. (The header will have to read “Proton physics: stable beams” to see these curves). A Tombstone To SUSY ? Geneva, 5 March 2012. Results presented by the LHCb collaboration this evening at the annual ‘Rencontres de Moriond’ conference, held this year in La Thuile, Italy, have put one of the most stringent limits to date on the current theory of particle physics, the Standard Model. LHCb tests the Standard Model by measuring extremely rare processes, in this case a decay pattern predicted to happen just three times out of every billion decays of a particle known as the Bs (B-sub-s) meson. Anything other than that would be evidence for new physics. 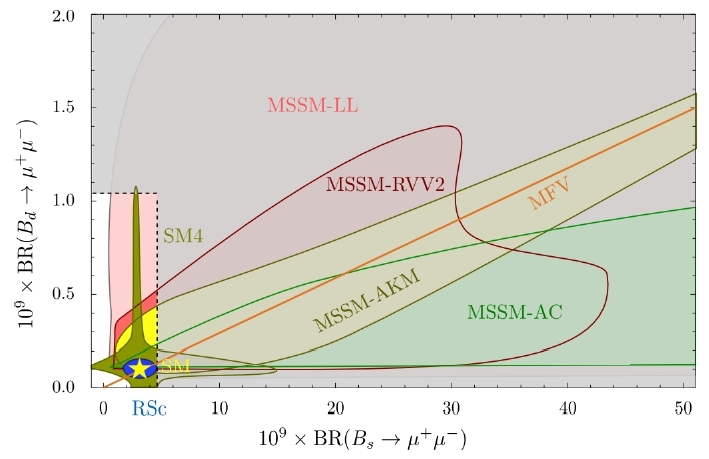 Measuring the rate of this Bs decay has been a major goal of particle physics experiments in the past decade, with the limit on its decay rate being gradually improved by the CDF and D0 experiments at Fermilab, LHCb, and most recently CMS at CERN1. The Standard Model is a highly successful theory that has been put to the test by experiments over several decades, and come through unscathed. Nevertheless, it is known to be an incomplete theory, accounting for just the 4% of the Universe that is visible to astronomy. New physics is needed to account for the remaining 96%. Such new physics could manifest itself directly, through the production of new particles that would be detected by the ATLAS and CMS experiments, or indirectly through the influence it would have on rare processes of the kind studied by LHCb. The LHCb particle detector is a highly specialised instrument specifically designed to study short-lived B mesons, and is systematically investigating the rarest decays of these particles. Since the Standard Model gives very precise predictions for such decays, they provide a very sensitive testing ground for new physics. 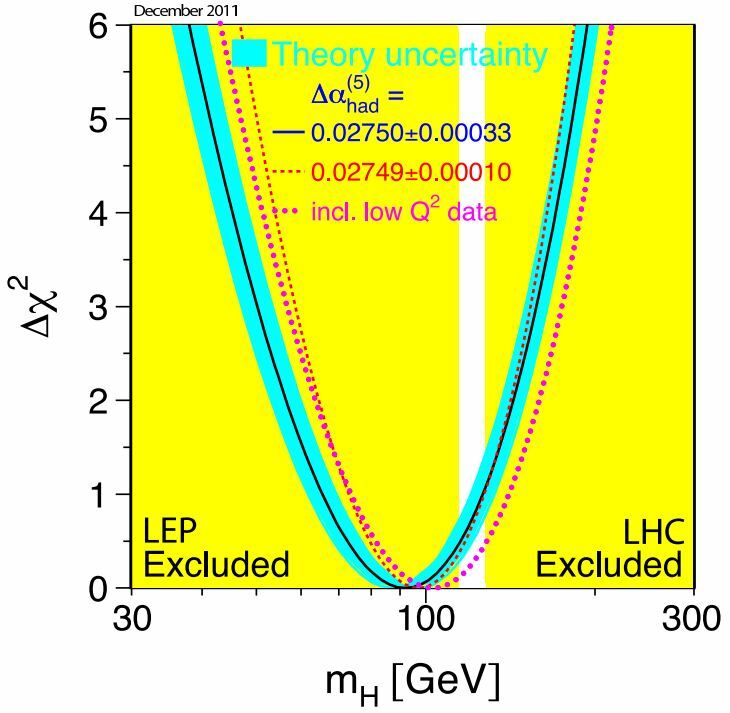 The latest LHCb result constrains the decay rate for Bs to two muons to be less than 4.5 decays per billion Bs decays. That does not rule out new physics, but does start to constrain theoretical models for it, and helps to set the direction for searches in all the LHC experiments. This result is scheduled to be submitted to the journal Physical Review Letters on 20 March. After a brief introduction to the theoretical basis of the Higgs mechanism for generating the masses of elementary particles, the experimental searches for Higgs particles will be summarized, from bounds at LEP to inferences for LHC. The report will focus on the Standard Model, though some central results on extended Higgs systems, as conjectured for example in supersymmetric theories, will also be recapitulated. Alternative scenarios based on spontaneous symmetry breaking by novel strong interactions are adumbrated at the theoretical level…..